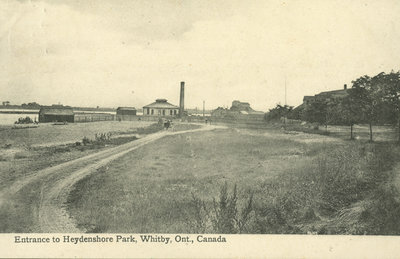 A postcard showing the entrance to Heydneshore Park. View looking west across the to Whitby Harbour. The building in the background at centre is the water pump station, built in 1904. The building in the background at right is the Harbour Company grain elevator, built in 1867 and demolished in 1916. Mrs. S. H. Thorne, Bobcaygeon, Ont. Heydenshore Park Entrance, 1906, George I. Wilson, Whitby Archives, P2013_001_012A.